BSA30. 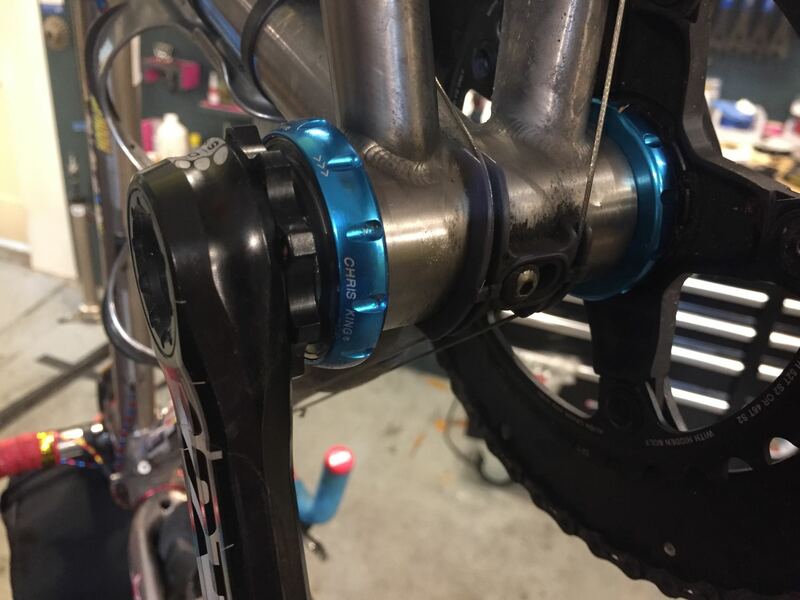 Yet another bottom bracket standard? Yes and no, but…mainly no. Okay, but what is it? BSA30 isn’t so much a new standard as the intersection of two independent standards. Simply put, it’s an external bearing bottom bracket that allows a 30mm alloy spindle crankset to fit on a English-thread frame (aka BSA/Birmingham Small Arms standard, aka BSC/British Standard, ie 1.37″x24TPI). Not all 30mm spindle cranksets will fit though, just those with a wide spindle. 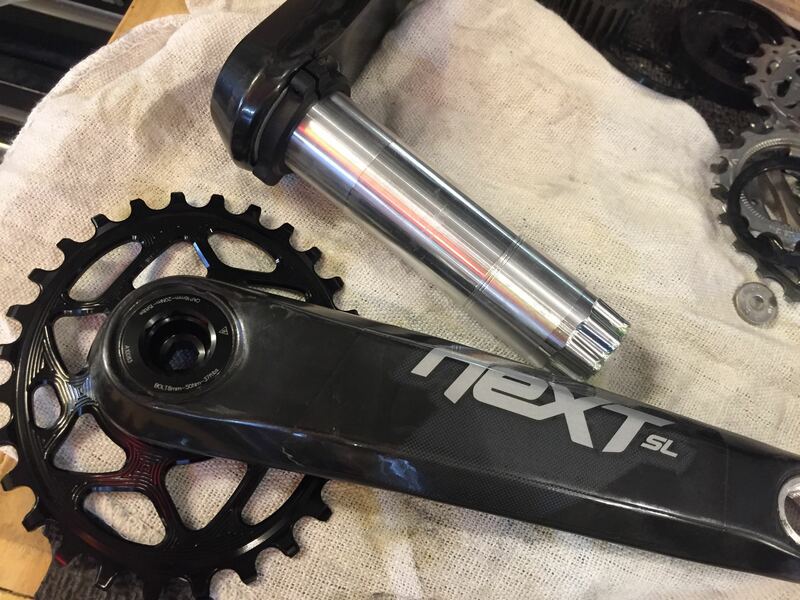 BB386, its mtb cousin BB392, or similar (Rotor Rex, Race Face 30, others) will fit, but regular BB30 cranksets usually don’t. Just to be more confusing, certain SRAM “BB30” cranksets are easily modified into BB386. Basically every major player in the crankset game (except Shimano and Campagnolo) is ready to move to 30mm spindles for their mid to high-end product, but there are many new frames still being made with English-threaded bb shells, besides the many millions of pre-existing bikes. 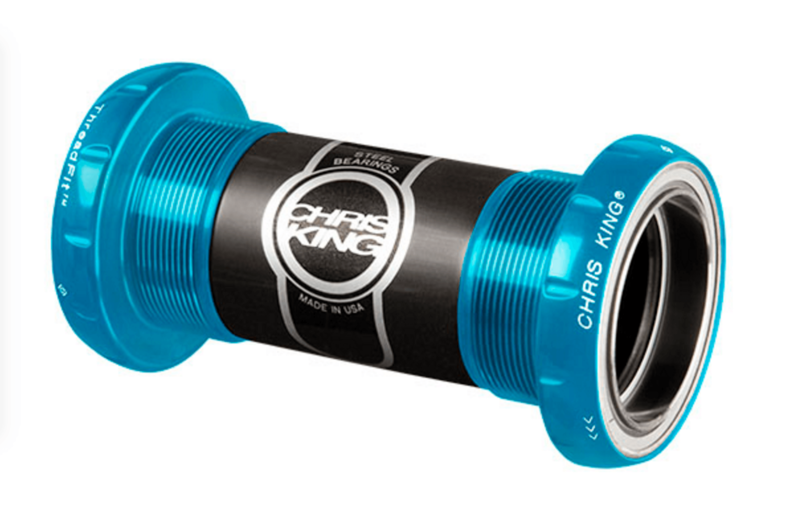 This is where King have chosen to bring in their new ThreadFit30 bottom bracket. It uses the same bearings as their PressFit30, which means that it can be easily greased with their special injection tool. And of course, the Threadfit30 comes in all the garish colours people demand from the Portland-based company. Of course, not in pink, gold, or pewter since King is in the process of phasing out those hues. Sometime next month…coinciding with NAHBS… they will announce 3 new colours for all their products. I’m convinced that they’re bringing back purple because –hello?- purple is a f***ing awesome colour. But as much as I nag they won’t confirm anything. The King ThreadFit30 BB seen here with a Rotor 3D Plus (road) crankset. 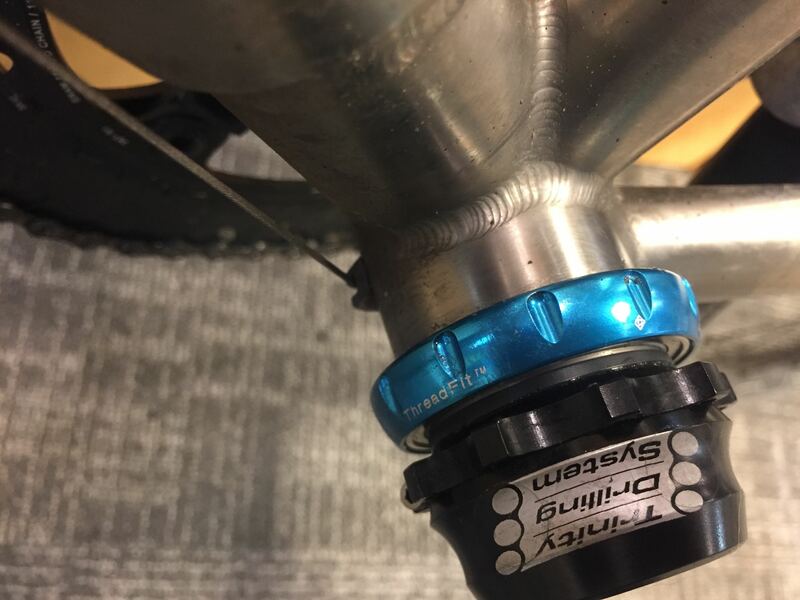 One thing though, currently King is only targeting 30mm spindle mtb cranks (BB392-style) with the ThreadFit30, which means, like mtb BBs with 24mm external bearings, it fits natively on a 73mm oversized shell or 68mm shell with a 2.5mm spacers fitted before the BB cup on either side. That configuration places the cups too wide to fit BB386-style road cranksets on road frames (always 68mm), and even if you remove the 2.5mm spacers, the plastic sleeve that fits between the cups is too wide. If you’re super ridiculous like me, you could carefully trim off 5mm and then tediously hand file a taper into the edge to replicate the original contour. Honestly I could have done it better if I had use of a lathe, but I was impatient to just get it done. 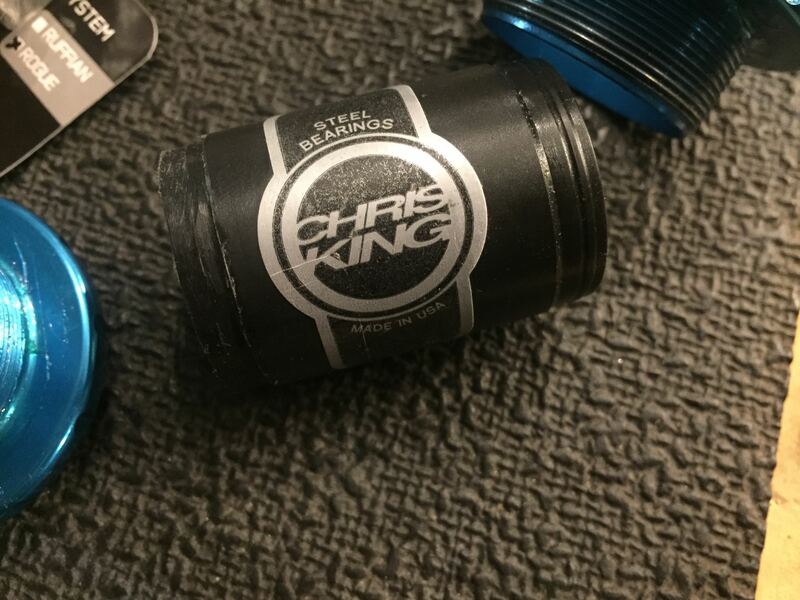 In the future Chris King will probably offer the ThreadFit30 with a narrower sleeve specifically for road cranks, since they tell me they’ve been getting a lot of requests for such. However such convenience is at best several months away. Meanwhile, I’ll been spinning a set of Rotor 3D Plus road cranks on a ThreadFit30 installed in my Davidson titanium S&S road frame. In above photo, plastic sleeve has been shortened on the lefthand side, then a shoulder was hand-filed to fit the sleeve into the bearing cup.